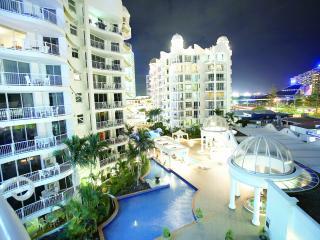 This Gold Coast accommodation is ideally located in the centre of the cosmopolitan Broadbeach area. Phoenician Resort, Broadbeach is within walking distance of the white sandy patrolled Gold Coast beaches. This luxuriously appointed Gold Coast accommodation boasts modern 1 and 2 bedroom apartments that are all fully self-contained making them ideal for an extended family holiday or couples getaway. At Phoenician Resort, Broadbeach, there are a number of facilities to enjoy including indoor and outdoor pools, lush tropical gardens as well as health and spa facilities, fully equipped gymnasium, bbq area and games room. This Gold Coast accommodation is a short stroll from the Broadbeach cafe society, Pacific Fair, The Oasis Shopping Centre and the Casino. The Phoenician Resort, Broadbeach is a Gold Coast holiday resort with everything you've ever dreamed of. Broadbeach on the Gold Coast offers a wonderful holiday experience that can be as casual and relaxed or as refined and energetic as you like. 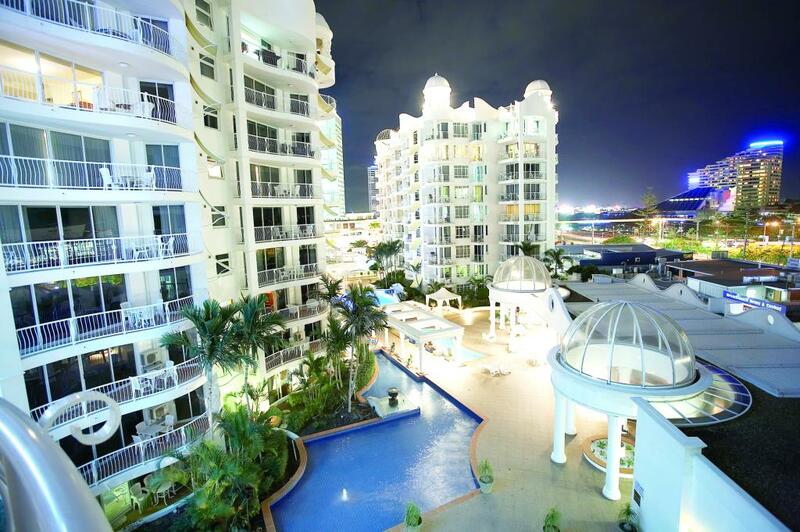 Phoenician Resort, Broadbeach offers a selection of spacious 1 and 2 bedroom full self contained apartments. 2 Bedroom Apartment: Features ensuite off master bedroom as well as main bathroom. Bedding is 1 Queen Bed + 2 Single Beds OR 1 King Bed + 1 Queen Bed OR 2 Queen Beds. Maximum room capacity is 5 Adults & Children. Apartments at Phoenician Resort, Broadbeach have full kitchens for guests who like to dine in. Or just a stroll away is the Broadbeach cafe society, Pacific Fair, Oasis Shopping Centre and the Casino. The dining options in Broadbeach are endless.